Her name means "plenty" or "overflowing riches." She has also been called "the beautiful maiden of success." Sacred to Abundantia is a cornucopia overflowing with gold coins, reminding us that the Universe offers us infinite abundance. Her message to us is that there is always enough. She helps us to align with an optimistic attitude and focus on positive expectations that bring blessings and benefits for the Higher Good. Being attuned to Her energy brings forth abundance in love, spirituality, joy, faith as well as protection of your savings and valuables. She is considered a protector of savings, investments and wealth. She helps lift one out of “poverty consciousness” and into a place of gracious acceptance, peace and joy in the sure knowledge that I'm completely taken care of, immediately and in the future. 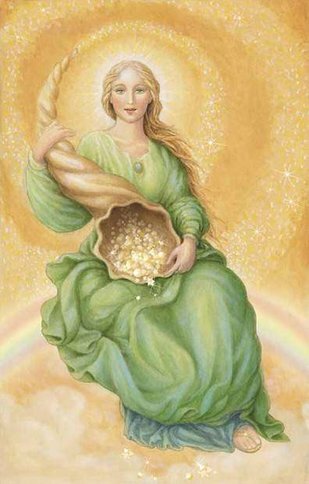 In Roman mythology, Abundantia brought money and grain to people while they were sleeping, shaking her gifts from the cornucopia she continuously carried. She is truly the Goddess of abundance, gold coins pour out around her, and where she walks there is a trail of gold left in her wake. She is beautiful and pure, patient and loving,with a generous kind heart that lovingly asks you what you need so that she may fulfil your wish. If you invoke her before bedtime She will attend your dreams to answer any questions you have about money and finances. Her answers and solutions will always lead you towards the Higher Good rather than simple monetary gain. Beautiful Abundantia, I desire to be like you—carefree and filled with faith that my supply is already met in all ways. Help me replace any money worries with joy and gratitude. Help me open my arms so that Heaven may easily help me. Thank you for all of your guidance, gifts, and protection. I'm truly grateful, and I'm abundantly, joyful and fulfilled. I let go, and relax in the sure knowledge that I'm completely taken care of, immediately and in the future. To call the energies of Abundantia, write a petition or prayer on a piece of parchment then light it on fire. Say Abundantia, beautiful Goddess of abundance, smile for me. As an offering of thanks give her a white flower, or a gold coin.